So, the January transfer window has finally shut. Well, it doesn’t make much difference to the Arsenal team, anyways. Gooners around the world, waited in anticipation and agony, and in hope against hope, that Arsene Wenger will finally bow down to their wishes and sign one massive player for a truckload of money, who would transform the fortunes of the club, and more concerningly, the immediate on-field problems. Of course, that didn’t happen. We signed one massive player though, who has a legendary status at the club, a beard and has taken 34 revolutions around the sun. His name is Thierry Henry. He also has the small matter of 226 goals marked across his name. Lots of banter coming in about the second signing though. Wenger: Can we have Gotze? Wenger: Can we have Kagawa? Wenger: Can we have Barrios? Wenger: Can we have Großkreutz? Dortmund: Hang, on a second. You can have Thomas Eisfeld for £420,000. Wenger: Really? WOW!! OK, I will take him. And thats how the very exciting transfer window grinded to a halt. We have an unknown midget from the minehouses of Dortmund, who will soon be bossing our midfield. Here’s hoping we have unearthed a gem. Arsene Wenger certainly thinks so. Meanwhile, there were some players going out on loan for the rest of the season. Chuks Aneke extended his loan spell at Stevenage. Let’s hope he can score the winner against Tottenham in the FA Cup 5th Round. Riyo Miyachi, a schoolboy a year ago, has been loaned out to tonight’s opponents, Bolton. Let’s hope he returns a Wilshere. Sanchez Watt, another youngster, who has spent spells at Leeds United and Sheffield Wednesday, has joined FA Cup high-flyers Crawley Town. And there could be one more exit. Anzhi Makhachkala (hope I got that right) are keeping tabs on out-of-sorts Russian playmaker Andriy Arshavin. The Russian transfer window closes in 3 weeks time, giving them plenty of time to hammer out a deal. 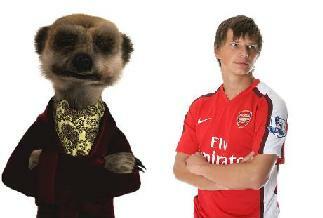 Arshavin has a mixed time in the English capital. After sparkling performance for Russia in the European Championships in 2008, he was under the radar of various clubs across Europe, including Barcelona, Real Madrid and Inter Milan. However, Arsenal was his destination as a last-second deal was clinched on February 2nd. His impact was instant. He scored a brilliant goal from a narrow angle against Blackburn Rovers and then was a crowd favourite after he put up a once-in-a-lifetime performance at Anfield, netting past Liverpool 4 times. In the 2009-2010 season, he was played as a striker in most of the games, thanks to the club’s huge injury list. He further scored 12 goals and made 7 assists through the season. Throughout the season, he was a popular figure in the English media. First, for his voice, where he was compared with a meerkat. And then, for his views on English weather and driving women. He despised the gloomy English weather as well as female hands behind a steering wheel. The meerkat and his poorer cousin! His 3rd season, he will be fondly remembered for the winner against Barcelona, which came at the end of a well-worked move, and was probably Arsenal’s best European performance in a long-long time. But, this season had been the low-point for the burly Russian. He has looked completely out of sorts and the Emirates crowd has been unforgiving. There have been complaints about his willingness and his concentration. He has had the odd effort though, against Bolton (Carling Cup), Leeds and QPR, where did much of what was constructive. The lowest ebb came when he came on to replace Alex Oxlade-Chamberlain in the match against Manchester United. A chorus of boos greeted him as he ambled his way on to the pitch. At that moment, I really felt for the guy. But, probably, a fresh challenge would do both, him and the club good. Anyways, enough about Arshavin, for now. Arsenal welcomed back Coquelin, Arteta, Henry and Sagna back into the team against Aston Villa, after all suffered uneven times out in the physio room. Arteta will be the most important man back. He has been the fulcrum in the engine room and has been sorely missed in the defeats to Swansea and Manchester United. Sagna, who injured himself in the North London derby, back in October, is another player who has been sorely missed. His deputy, Carl Jenkinson, also fell prey to the injury monster. Wenger has since played Djourou, Coquelin, Koscielny and Yennaris at right-back, all to various success levels. Stability at that position is vital, and Sagna, who has been Arsenal’s most consistent player, over the course of 4 seasons, provides exactly that. Also, Arsenal welcome back Kieran Gibbs, who has resumed training with the squad and should be fit for the Blackburn game over the weekend. Staying in the physio room, Jack Wilshere suffered another ‘setback’, which could keep him out for another 6-8 weeks, or probably the end of the season. This is really bad news, and probably sparked the Eisfeld signing. Arsene Wenger had this to say on the young midfielders’ setback. And while we are about it, Eisfeld is another injury-prone player. He had an extensive medical at the club, before he was signed, and also a training session, to monitor his fitness levels. He had suffered a horror injury to his anterior cruciate ligaments (whatever that is!) in 2009. All we can hope is he can keep himself fit and be a vital player for the team. And yes, while we are still about it, I got an interesting stat online. Since August 2002, Arsenal has suffered 138 more injuries than Chelsea to first team squad members. In the same period, Arsenal has suffered 86 more injuries than Manchester United. To what extent these stats are true, I have no idea. But, it does make you think what may be the reason. Is it bad luck or just that we sign injury-prone players, who suffer long times out in the primes of their career, and are not the same when they make their returns. Moving, on the Aston Villa game has been one of the highlights of the season so far. 2-0 down at half-time and 3-2 up, in 16 minutes of the second half is no ordinary feat. So, what exactly might have ignited that comeback. There have been reports of the captain falling out with the manager after the Manchester United loss. But, van Persie was quick to dismiss them all. And, celebrations in the Villa game, have raised a suspicion or two. van Persie raced his way to celebrate his second goal with Thierry Henry, while he gave Wenger as much as a little look. Yes, I am blowing things out of proportion here. Henry, Vermaelen and van Persie did have a word or two with the team, but that doesn’t necessarily mean things are falling apart in the team. Arsene Wenger still reigns supreme and has a control over all things on the field. Theo Walcott revealed later, what van Persie’s words were at half-time. And, supposedly, Wenger had this to say. Walcott has been doing a lot of talking about winning a trophy for the fans. And that flukey goal over the weekend did the credentials no harm. Meanwhile, Robin van Persie escaped a possible match-ban after Villa boss Alex McLeish claimed he had elbowed his player, Carlos Cuellar. (Go, find yourself a different reason, McLeish!). And, in other news, Alex Oxlade-Chamberlain has been given the backing of Arsene Wenger, to be selected for England, for EURO 2012. ‘The Ox’ was thrown into the limelight in the disastrous mauling at Old Trafford, which I don’t want to talk about. Since then, he has put on impressive displays, whenever he has played, scoring goals against Shrewsbury in the League Cup and Olympiakos in the Champions League; his most impressive performance coming in the 2-1 loss at home to Manchester United. He has drawn comparisons with England’s best striker at the moment, Wayne Rooney, who is similiar in build and style of play. Well, all’s well that end’s well, we are in the 5th Round of the FA Cup, and will face either Sunderland/Middlesbrough, away from home, on 18th February. The FA Cup seems to be Arsenal’s best bet of a trophy this campaign, considering we are 18 points adrift of the leaders, and we will face Barcelona in the next round of the Champions League, should we ward off AC Milan (It’s a conspiracy). With heavyweights Manchester City and Manchester United, both knocked out; the remaining giants Arsenal and Liverpool, along with Tottenham and Chelsea, are favorites to life the famous cup. Moving on to the game tonight. Bolton will be particularly hard to beat, this time around. Last time, Arsenal trounced them 3-0, thanks to a red card brandished to Dave Wheater, in a game, in which van Persie scored his 100th Arsenal goal. Bolton went on a terrible run, and occupied the last spot in the league for long periods, but since the turn of the year, they have picked up vital results. They have beaten Everton and Liverpool in the league and ensured progress in the FA Cup with wins over Macclesfield and Swansea. Their last game against Liverpool was the best performance from the Trotters this season. Having lost to Manchester United, 3-0, just a week earlier, they put in a battling performance against the Reds. This time round, the battle will be won in the midfield. Bolton captain Nigel Reo-Coker and Fabrice Muamba will look to cut all supply lines leading to van Persie, managed by Ramsey and Arteta. David N’Gog put in a good performance against his old club last week, but emulating it in this fixture will be hard for the inconsistent French striker. Bolton lost Gary Cahill to Chelsea, but have replaced him with Tim Ream from New York Red Bulls. He will, however not feature tonight, as he is back in the USA, sorting visa’s. Bolton, will, in most probability, go with the same team that started last week. Arsenal’s leaky defence will be tightened with the returning Sagna, who is most likely to feature, at the expense of Coquelin. Arteta, will take his place in the centre of midfield alongside Ramsey, with Rosicky having to content with a place on the bench. There have been rumours of Wenger planning to give Ramsey a breather, which would, of course mean Rosicky will take his place. 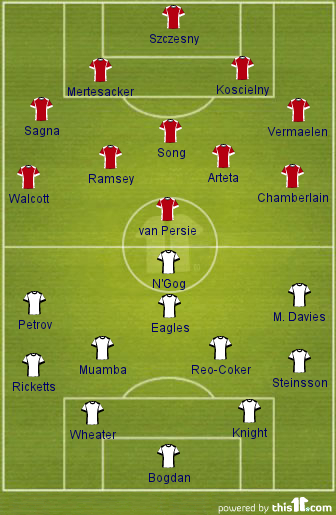 Here is how the teams could line up. Yesterday’s results will give more impetus to Arsenal to collect a win. Chelsea extended the difference between themselves and the Gunners to 6 points, while Liverpool’s win at Wolves means they leapfrog us to 5th place, 2 points ahead in the table. Memories of last time will hopefully not hover this fixture. Tamir Cohen scored a 89th minute winner for Bolton, despite Arsenal dominating vast periods of the game. That loss scuppered any hopes of a league title.